Our unique black seersucker tuxedo has all the benefits of this wicking and light traditional fabric. What a wonderful alternative to a heavy weight wool tuxedo, assuring comfort and coolness in June weddings and other warm weather social events! 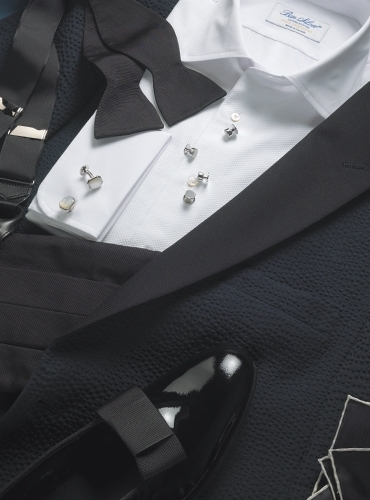 Beautifully fitted as all of our dinner jackets and trousers. 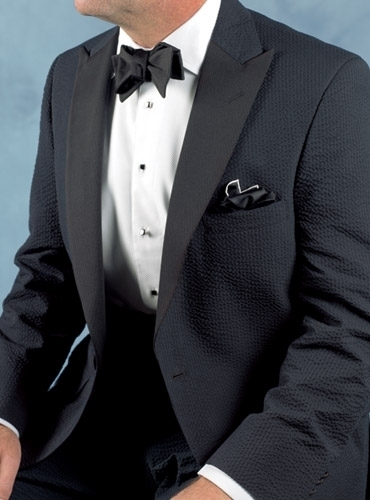 The single button peak lapel jacket has side vents and lapels are faced with black grosgrain; a grosgrain braid is on the side seams of the pant legs. Size 34R plain front pants.